…One full-moon night in the month of Vaiśākha [April and May], Śrī Caitanya Mahāprabhu went to a garden. The Lord, along with His devotees, entered one of the nicest gardens, called Jagannātha-vallabha. In the garden were fully blossomed trees and creepers exactly like those in Vṛndāvana. Bumblebees and birds like the śuka, śārī and pika talked with one another. A mild breeze was blowing, carrying the fragrance of aromatic flowers. The breeze had become a guru and was teaching all the trees and creepers how to dance. Brightly illuminated by the full moon, the trees and creepers glittered in the light. The six seasons, especially spring, seemed present there. Seeing the garden, Śrī Caitanya Mahāprabhu, the Supreme Personality of Godhead, was very happy. 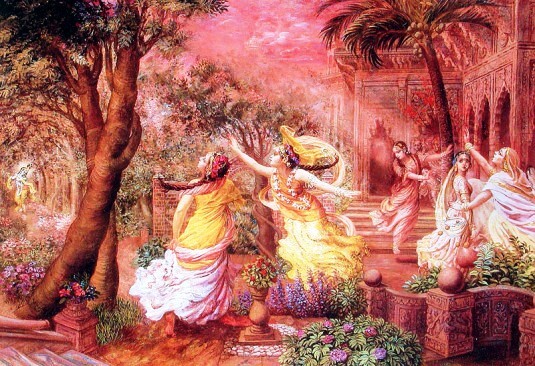 In this atmosphere, the Lord had His associates sing a verse from the Gīta-govinda, beginning with the words “lalita-lavaṅga-latā,” as He danced and wandered about with them. 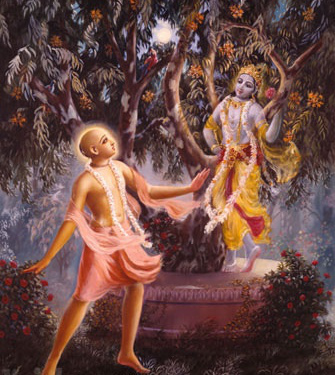 As He thus wandered around every tree and creeper, He came beneath an aśoka tree and suddenly saw Lord Kṛṣṇa. When He saw Kṛṣṇa, Śrī Caitanya Mahāprabhu began running very swiftly, but Kṛṣṇa smiled and disappeared. Having first gotten Kṛṣṇa and then having lost Him again, Śrī Caitanya Mahāprabhu fell to the ground unconscious. The entire garden was filled with the scent of Lord Śrī Kṛṣṇa’s transcendental body. When Srī Caitanya Mahāprabhu smelled it, He fell unconscious at once. The scent of Kṛṣṇa’s body, however, incessantly entered His nostrils, and the Lord became mad to relish it. Śrīmatī Rādhārāṇī expressed to Her gopī friends how She hankers for the transcendental scent of Kṛṣṇa’s body. Śrī Caitanya Mahāprabhu recited that same verse and made its meaning clear. This is a verse found in Govinda-līlāmṛta (8.6). “The scent of Kṛṣṇa’s transcendental body is so attractive that it enchants the bodies and minds of all women. It bewilders their nostrils, loosens their belts and hair, and makes them madwomen. All the women of world come under its influence, and therefore the scent of Kṛṣṇa’s body is like a plunderer. “Falling completely under its influence, the nostrils yearn for it continuously, although sometimes they obtain it and sometimes not. When they do they drink their fill, though they still want more and more, but if they don’t, out of thirst they die. Śrī Caitanya Mahāprabhu, His mind thus stolen by that scent, ran here and there like a bumblebee. He ran to the trees and plants, hoping that Lord Kṛṣṇa would appear, but instead He found only the scent of Kṛṣṇa’s body. Both Svarūpa Dāmodara and Rāmānanda Rāya sang to the Lord, who danced and enjoyed happiness until the morning arrived. Then they devised a plan to revive the Lord to external consciousness. Thus, I, Kṛṣṇadāsa, the servant of Śrīla Rūpa Gosvāmī, have sung of four divisions of the Lord’s pastimes in this chapter: the Lord’s devotion to His mother, His words of madness, His rubbing His face against the walls at night, and His dancing at the appearance of Lord Kṛṣṇa’s fragrance. Śrī Caitanya Mahāprabhu thus returned to consciousness. He then bathed and went to see Lord Jagannātha. The pastimes of Lord Kṛṣṇa are uncommonly full of transcendental potency. It is a characteristic of such pastimes that they do not fall within the jurisdiction of experimental logic and arguments. When transcendental love of Kṛṣṇa awakens in one’s heart, even a learned scholar cannot comprehend one’s activities. This verse is quoted from Bhakti-rasāmṛta-sindhu (1.4.17). The activities of Śrī Caitanya Mahāprabhu are undoubtedly uncommon, especially His talking like a madman. Therefore, one who hears of these pastimes should not put forward mundane arguments. He should simply hear the pastimes with full faith. This entry was posted in A. C. Bhaktivedanta Swami Prabhupada, Krishna Consciousness, Sri Caitanya Mahaprabhu, Sri Caitanya-caritamrta and tagged A. C. Bhaktivedanta Swami Prabhupada, camphor and lotus, Krsna's body, sandalwood pulp, scent of Krsna's body, Sri Caitanya Mahaprabhu, the personality of Godhead, transcendental secnt of Krishna. Bookmark the permalink.